If you think putting huge stickers of your school logo on your laptop case is soooooo over the top, show some subtle school pride with Speck’s sleek and stylish MacBook covers- you can buy a case for each of your school’s colors, and mix-and-match for an extra spirited look! 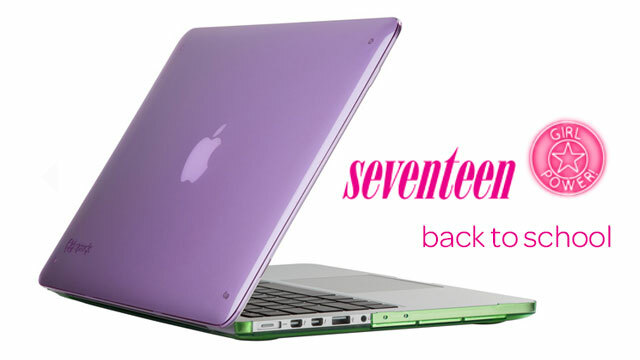 Of course as Seventeen points out, buying different colored cases and swapping with friends is one of the most fun- and colorful!- ways to dress up your laptop. Our newest neon-colored cases are flying off the shelves for their bright, bold looks. Shop SmartShell Neon for MacBook Air, MacBook Pro, and MacBook Pro with Retina display. MacBook Pro Retina (15″) user? You’re in luck! Check out our speck-tacular sales on SeeThru and SeeThru Satin cases.